Sump pumps are designed to prevent basement flooding due to ground water intrusion, but what if your flooded basement is caused by a plumbing leak, such as from a burst washing machine hose or failed water heater? Water damage from a plumbing leak can be reduced if there's a way for the water to drain into your sump pump. 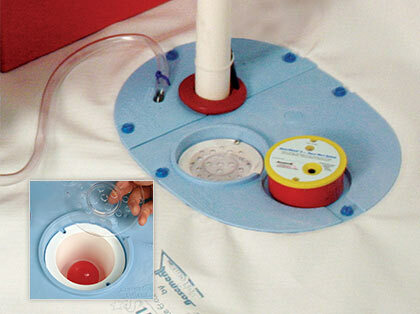 Basement Systems' sump pump systems include a floor drain built in to the cover. A hole in the floor drain basin is covered by a hollow ball. The ball floats when water drains into the basin, allowing the water to drain into the sump liner. This design also helps prevent odors and radon gas from entering the basement. Basement Systems offers a variety of sump pump systems with unique features designed to keep your basement dry and healthy. Call us at 1-800-638-7048 to schedule a consultation with a dealer in your area and get a free estimate on your sump pump installation.